The Acte de Vente or Acte Authentique is the final contract to be signed by the buyer and seller, when a property is being purchased in France. This document must be witnessed by a Notaire. There are 3 essential parties that need to be present; the buyer, the seller and the Notaire. If both the buyer and the seller have a notaire, only one of them needs to attend. It is also possible to appoint a power of attorney (see below) if you’re in the UK and not able to make the trip to France. The Acte de Vente will usually be signed within 3 to 4 months from signing the Compromis de Vente. For new build properties it depends on the original contract. The process can be fairly quick, if the developer has already obtained planning permission. Much of the same information is covered in this contract as the Compromis de Vente. Buyers will need to provide original birth, marriage and divorce certificates (see Required Documents). Differences include the fact that the Acte de Vente has a much wider description of the property, details of the French Mortgage, details of insurance policies, reports on lead, asbestos, termites etc., and a breakdown of the tax payable by the seller. A draft of the contract will be sent to the vendor prior to signing. All the details must be clear and the buyer must understand 100% of the contract prior to the signing date. If necessary, a professional translator should be used to translate the contract and attend the signing (though the cost of this will be charged to person requiring the translation). A date will have been fixed for the signing, but many factors can cause it to change so it is recommended to keep in touch with the estate agent and notaire to ensure things are running to schedule or to alter your travel arrangements if you’re not resident in France. The contract must be signed in France by law. 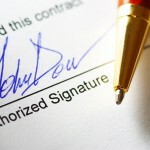 It is however, possible to appoint a Power of Attorney who can attend the signing on your behalf. This could either be a trusted friend or family member, or the notaire’s clerk but it cannot be the estate agent. The Power of Attorney document will need to be witnessed by notary or solicitor in the in your own country. By the time the contract is signed, the buyer should have made all the necessary arrangements to fund the purchase and pay the costs and fees. These include – taxes, Notaire’s fees, and the first insurance premium. All the necessary funds should have been transferred from the buyer to the Notaire’s bank account, and the Notaire will also need to release money for the initial mortgage payments if necessary.